With the growing complexity of personal mobile communication systems demanding higher data-rates and high levels of integration using low-cost CMOS technology, overall system performance has become more sensitive to RF analog front-end impairments. Designing integrated transceivers requires a thorough understanding of the whole transceiver chain including RF analog front-end and digital baseband. Communication system engineers have to include RF analog imperfections in their simulation benches in order to study and quantify their impact on the system performance. Here the author explores key RF analog impairments in a transceiver and demonstrates how to model their impact from a communication system design view-point. He discusses the design aspects of the front end of transceivers (both receivers and transmitters) and provides the reader with a way to optimize a complex mixed-signal platform by taking into account the characteristics of the RF/analog front-end. Uniquely the book bridges the gap between RFIC design specification needs and communication systems simulation, offering readers RF analog impairments modeling knowledge and a comprehensive approach to unifying theory and practice in system modelling. It is of great value to communication systems and DSP engineers and graduate students who design communication processing engines, RF/analog systems and IC design engineers involved in the design of communication platforms. Dr. Smaïni is currently RF System & DSP group manager at Marvell’s operations in Switzerland, a leading semiconductor company. In 2010 Dr. Smaïni gave a tutorial on RF System Design for Advanced Wireless Transceivers at the IEEE Solid-State Circuits Conference. Previously he has worked as an R&D consulting engineer for ALTEN, Marseille, France, where he developed a frequency agile radar beacon for navigation aid, which is now in service on the French coastline. Immediately prior to joining Marvell in 2006, from 2002 he was with STMicroelectronics, Switzerland in the RF System and Architecture Group for wireless communications working on Ultra Wide-Band impulse radio, 3G cellular phones, and advanced radio architectures for OFDMA technology. 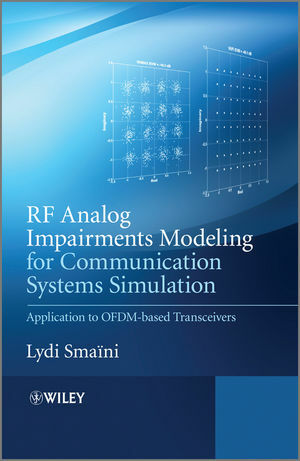 RF Analog Impairments Modeling for Communication Systems Simulation - click here for MATLAB® codes relating to the RF analog impairment modelling described in the book.